EURO TOOL is proud to present this wire rounder set. The set has two different sized 'cups' and a pin vise to hold your 'cup-rounders'. This set includes our new PIN-224.00 Wood Top Pin Vise and two cup burs. One bur has an inside diameter of 1.2mm and the other a diameter of 1.8mm. 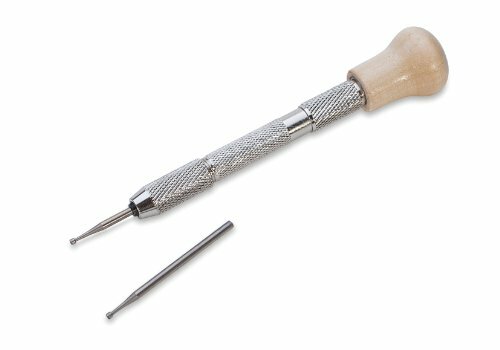 The pin vise has a comfortable round wood top and a knurled, cross-hatched neck for secure grip and comfort. To properly use a 'cup bur': Start by assembling the pin vise with a size appropriate collet and a cup bur attachment. Then, hold the pin vise handle and insert the wire end into the cup bur. Grasp the knurled steel chuck and turn the cup bur. Repeat the process until you have your desired wire tip finish. If you are a craftsperson who routinely works with wire then this tool is a 'must-have'. If you are making wire jewelry or working with sharp wire ends, this wire rounder set will be essential. EURO TOOL stands for excellence and is confident the quality, usefulness and durability of your EURO TOOL item will exceed your level of expectation. Please make sure your item has the EURO TOOL name. Other comparable competitor items are of inferior quality, design, production and will not meet your level of expectation as a EURO TOOL product will. Specifics - This wire rounder set includes the EURO TOOL PIN-224.00 Wood Top Pin Vise and two cup burs. The cups measure 1.2mm and 1.8mm at the tip. The pin vise has a wood handle and knurled neck for superior comfort and grip. Uses If you are a craftsperson who routinely works with wire then this tool is a must-have. This tool is typically used to smooth and round the sharp ends of wires. Superior Quality EURO TOOL products are the pinnacle of quality, and stand alone at the top in the industry of craft, hobby, DIY projects and jewelry tools. Make sure your tools have the name EURO TOOL.